A quick way for any player to make himself better is to think about what he himself doesn't like to play against." When I was in high school my Coach use to plaster Coach Knight quotes all over the place. As a coach I find myself thinking about what defense would work in the next game. I try to look at other teams tendencies and top scorers and so on and so forth. Sometimes when the scouting isn't sufficient I often think to myself that I really hated playing against people that were in my face the whole game and never let me breathe without smelling it. Now as an offense minded player it would be easy to think that the more tools you have in your toolbox the harder it is to guard. Or if you do only one thing well make sure it fits into the game plan. However, the common sense part of this quote is that if it is hard to guard then by logic do the thing that is hard to stop. In other words, if it hurts when you bang your head against the wall then don't bang your head against the wall. 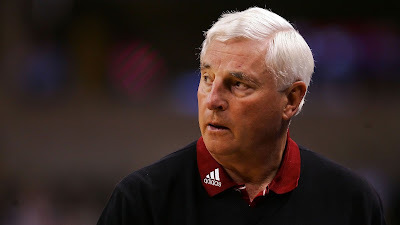 Bobby Knight was also quoted as saying that a coach shouldn't have to be there to push you, and that you should want to get better internally without any external pressure or coaching to seek out things and practice what will help you succeed. If that is what made Jordan, Magic, Bird, Curry, Lebron, KD, all the above successful...Then do that.